Knee replacement is typically the treatment of choice when arthritis becomes so advanced that normal function and mobility are significantly affected, and pain has reduced activities to a bare minimum. Interestingly enough, many people have a big misconception as to just what this procedure really is. 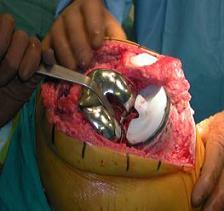 Many think it is something like a “transplant”, where the entire knee is removed, and a new one implanted. 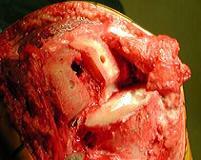 Joint replacement surgery is more a re-surfacing than a replacement. The patient’s own “host bone” remains intact, while the arthritic surfaces are shaved free of their damaged cartilage and in a shape that will accommodate the various shapes of implants. The use of special cutting guides enables this to occur. Let’s talk about some of the different procedures that are currently available to treat advanced, or “end stage” arthritis: Total, partial, uni-compartmental and patello-femoral replacement. 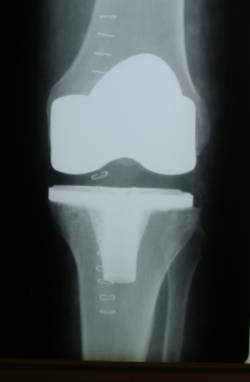 First, let’s discuss Total Knee Replacement. In this procedure, the areas of the joint that are re-surfaced are the distal end of the femur (thigh bone), the tibial (shin bone) surface and the under-surface of the patella (knee cap). The femur and tibial components are separated by a “spacer” constructed of space-age high density plastic that comes in a variety of thicknesses and configurations. The ends of the bones are cut and shaved in a fashion to allow for the precise fit of the trial, and subsequent final implants. The cut areas are then sized accordingly and temporary, “trial” implants are inserted over the cut surfaces to ensure a proper fit and to assure that the joint moves well. Once this has been accomplished, the final components are put into place. They can be fixed in place by one of three methods: they can be cemented in place using a special “bone cement” or they can be “press-fit” in which case components are used that have a rough coating on the back side that comes into direct, pressure fitted contact with the cut bone surfaces. The combination of a tight press fit and the “porous” rough coating on the back of the implants encourage a process known as “bio in-growth”, where the bone literally “heals” to the implant by growing bone into the rough porous coating. The third method involves a “hybrid” version of the two methods is employed where one implant is press fit and the other cemented into place.